Penny Kiley, Adam Johnson and Anna Wagstaff were the three branch delegates to the NUJ Delegate Meeting. We also had a mandate to oppose an NEC resolution moving the union’s subscriptions structure away from a system based on sector (books, PR, broadcasting etc) to one based on level of income. While most branch members supported such a move in principle, the motion would have created a two-tier system, with the new system applying only to new members – the sort of division that we routinely oppose when employers try to bring in changes to pay, terms and conditions for new staff only. Members felt that the fact that the motivation behind this proposal came down to practicalities rather than any wish to create division did not mitigate the impact it would have. However, when an amendment that would have secured a subs rise without the change to an income-related system was withdrawn, we were faced with the option of either supporting the NEC motion or condemning the union to going into the next two years with a falling real income. Given the loyalty and commitment shown by NUJ staff, who in recent years have shouldered a huge strain in staffing levels and pay freeze just as members have had most need of them, we weren’t prepared to do this. But we also weren’t going to accept having conference vote in a major change to our subs system with a gun held to its collective head. To be fair, most NEC members probably didn’t really want that either. Subs require an understanding between members and the executive – we accept we have to pay to get the unusually high level of support that NUJ organisers give us, but it’s our decision. Together with delegates from the Magazine and Book Industrial Council we went to the Standing Orders Committee, which oversees the running of the delegate meeting, and has historically seen their role as helping ensure delegates get the debates they want. SOC agreed to unravel the NEC motion to allow conference to vote first on the subs rise proposed in their motion before putting the new system to the vote. Oxford seconded the subs rise and got the overwhelming backing of delegates We spoke against hurrying into a new income-related system without first campaigning to bring all members on board, so that if and when the change is made, we all do it together. And delegates backed us on that as well. Result. The second area we were mandated on was to support motions critical of the NUJ’s magazine The Journalist, which branch members feel should be much more focused on what the union and its branches, chapels and members are up to, and more representative of all media sectors where the NUJ organises. Irritatingly, debate was curtailed on this section of the agenda to catch up on lost time, though Penny Kiley did get a chance to speak, and left delegates in no doubt about our criticisms. Our own four motions sailed through. Three thoughts struck me as I left the delegate meeting. First. While delegate meetings can take up a lot of branch time, what with motions and amendments and mandating and everything, and cost a fair amount to organise, there are genuine drawbacks to having them every two years as we have recently started doing. The NUJ has weathered a terrible storm without being gobbled up by larger unions because the leadership has made difficult decisions and brought members with it. But keeping faith with members does mean giving them the final say in what happens, and two years turns out to be a long time, particularly in the current climate. Second. We shouldn’t always wait for delegate meetings to address important internal matters. We can raise discussion right now about how the union uses its magazine, and we can promote debate about moving everyone onto an income-related subs system, and it would probably be very good for union democracy if we did. Third. How good is it to have a delegation that does its homework in advance, comes to a branch meeting to get mandated on key issues, follows the debate, intervenes in the debate, votes as a delegation, and even finds time to give an accurate and sensible running commentary on key issues to members and other Twitter followers? 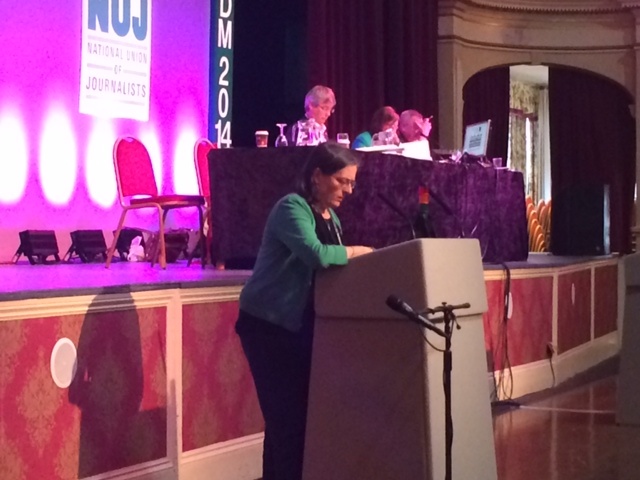 A more full report of the delegate meeting can be found on the NUJ website. The next delegate meeting will be in two years time in Southport. We always try to bring along at least one person who hasn’t been to conference before. Could 2016 be your year?